The grassfed beef sector has expanded rapidly over the past decade, ballooning from less than $40 million in domestic retail sales value in 2005 to $550 million in 2015. Annual sales growth of grassfed beef averaged 25-30% over the period. Interest in “100% grassfed” dairy is also taking off, with the sector poised to experience the same exponential growth as grassfed beef. This brings up a few questions. What can people who want to develop a vibrant grassfed dairy sector learn from the grassfed beef sector? What are the similarities? What are the contrasts? I have worked in both grassfed dairy and beef, and have come to realize that while differences exist, the two also have many similarities. Over the next three months I will explore those similarities and differences in production and marketing, ranging from cattle genetics and phenotype, to grazing strategies, to marketing. Let’s start with genetics, as both genotype and phenotype play huge roles in efficient grassfed production for both beef and dairy. Genetics that are wrong for grassfed will not just hamper economic performance, they can put you out of business. These are dairy cows that do well without grain. Note the similarities and differences of these quality grassfed beef cows and their no-grain dairy cousins. There are some common phenotypic traits shared by grassfed beef and dairy cows. Both are quite moderate in frame. Large-framed animals do not work for grassfed beef production, and neither do they work for 100% grassfed dairy. It is amazing how quickly the large-framed animals sort themselves out in the grassfed production system. With grass finishing of beef cattle, I can tell rather easily by the time an animal reaches 700-800 lbs. whether it is going to finish at a reasonable weight, age and degree of finish. Grassfed dairy animals tend to sort themselves out during the heifer development process. While you can have the “wrong” heifer make it to first lactation, her ability to perform on forages, produce sufficient milk and maintain decent body condition will show up very early on in that lactation if she does not have access to grain. The difference between right and wrong in this regard was clear a few months ago as I was doing some work with Maple Hill Creamery’s grassfed milk suppliers in New York. I was traveling with a friend from Wisconsin who admitted that he expected to see a bunch of “half-starved dairy cows” out in the pastures. When we saw highly productive cows in good to excellent body condition, he was pleasantly surprised. My friend recognized the cows were much more moderate in frame than he had anticipated. Large-framed, high-producing cattle simply do not work in grassfed dairy. Most modern Holsteins have no place here, as for decades they have been genetically selected for high milk production and large frames. Take them off a TMR and they fall apart pretty quickly. 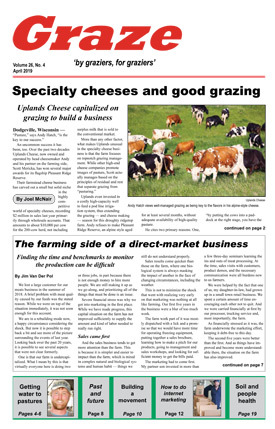 Successful grassfed dairy farms are milking smaller-framed, lower-producing dairy breeds such as Jersey, Ayrshire and Guernsey (along with some of the smaller-framed Brown Swiss), and dual-purpose breeds such as Milking Devon, Shorthorn, Dutch Belt, Canadienne, and Red Poll are also prevalent, especially in crosses. Some of the smaller-framed Friesian genetics coming out of New Zealand are working well, often in crosses with Jersey and other smaller-framed breeds. What is common among the best-performing grassfed dairy breeds and crosses is that they produce moderate amounts of fluid milk with high levels of components. The average mature weight of the optimally performing grassfed dairy cow will range between 900 and 1,100 lbs. I often see more A2A2 cows among these more moderate-framed breeds, too. In terms of phenotype, I look for females that are very feminine in appearance, being lean and clean about the head, neck and shoulders. Coarseness, roughness and thickness in these areas are not desirable. She also needs to have a wide muzzle to consume large amounts of forage dry matter on a daily basis. These cows should be “relaxed” in the heart girth, with good depth and circumference in this area. Cattle pinched in the heart girth tend to be higher-maintenance. When viewed from the front, there should be adequate width between the front legs in the brisket area. Cattle that are narrow in the brisket or chest floor also tend to be pinched in the heart girth. When you move back toward the midsection of the cow, she should “explode,” being very expressive in the lower mid-rib. When viewed from either rear or front, the lower mid-rib should be the widest part of the body. This is the digestive factory of the cow, and she needs room here for the expanded rumen activity required for complete reliance upon forages. The mid-section, or barrel, of the grassfed cow should be deep and exhibit excellent spring of rib. If the cow is carrying too much fat cover over the mid-rib section, she is putting too much into her own maintenance and not enough into reproduction, gestation and lactation. The efficient cow will show some slight to moderate fat cover over the front section of the ribs, but you should be able to see the 12th and 13th ribs without much trouble, especially when you observe her movement. As you move back through the hindquarters of the efficient cow, she should have adequate flesh in this region without showing excess thickness. This means the area between the hooks and pins should show evidence of fleshiness and not be too concave. There are some differences here between beef and dairy. In grassfed beef cows, I want to see a higher degree of fill between the hooks and pins, although even for dairy too much prominence to the hooks, pins, transverse processes of the spine and the 12th-13th ribs indicates she is not efficient enough in converting forage to performance. Another difference is in the hindquarters. I want to see more thickness through the rump and round of a grassfed beef cow than I do on a grassfed dairy cow. Grassfed dairy cows should be as “lean and clean” in the hindquarters as they are in the forequarter. Still, look closely at the grassfed dairy cows in photos above and compare them to the grassfed beef cow photos. All cows pictured are proven performers on grass. Notice how strikingly similar they are in phenotype, even though their end purposes are quite different. From everything I have seen in my travels throughout the country, dairy cows that cannot perform efficiently on forages show themselves more quickly than the problem cows in grassfed beef herds. When I visit grassfed dairy operations, cows that are not genetically suited for grassfed production are immediately obvious. They show up in body condition and they show up in the milk tank. In terms of “bone,” the most efficient cattle — both beef and dairy — are of moderate bone when examined through the front and hind legs. 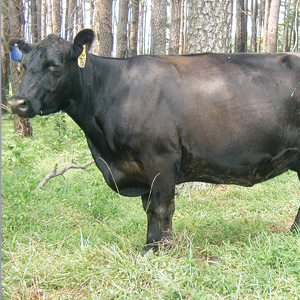 Cattle that are too fine-boned tend to have issues with maintaining adequate condition on forage-only diets and do not exhibit great longevity. Meanwhile, cattle that are too large-boned, especially those that are large and coarse about the front knees and back hocks, will require too many groceries in return for their performance. They also tend to have structural issues as they age. The similarities continue into the importance of soundness and adaptability, which are very important given the fact that longevity is so important to profitability. When you examine the economics of production in beef or dairy, longevity is one of the top three factors that affect profitability. Grassfed cattle have to travel each day to graze, so sound feet and legs that hold up over a period of many years are critical. Well-placed teats and solidly attached udders that maintain good suspension as an animal ages are important if she is going to stay around and make money for you. Teeth and eyes must hold up, too. Adaptability to your climate, your forage base and your management are all crucial to longevity and productivity. Select seedstock from cattle that are proven to work in your environment. Cattle that are not well-suited to your environment will expose themselves quickly in a true grassfed production system — much faster than in the grain-fed confinement model. Put all of this together, and both dairy and beef cows should live a long time in the grassfed system. It is not uncommon to find cows in grassfed beef herds that are well into their teens. The same characteristics are found in successful grassfed dairy herds, where I’ve seen many cows that are at least 10 years of age. It is delightful to see 13- to 15-year old dairy cows still in the milking string, and it is especially so when you consider how much these cows have added to the farm’s profitability over those years. Dr. Allen Williams is president of Livestock Management Consultants, LLC, based in Starkville, Mississippi.